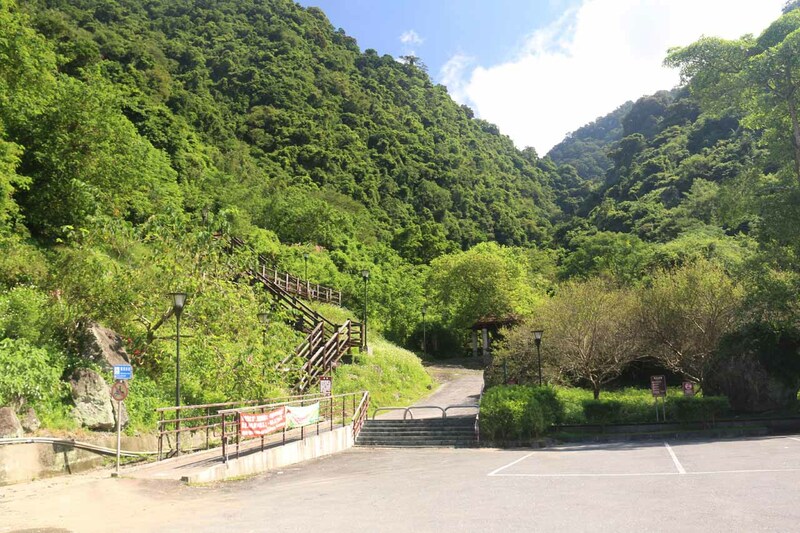 The Luoshan Waterfall (羅山瀑布 [Luóshān Pùbù]) was probably the most difficult to view of the waterfalls that we had seen in the east of Taiwan. 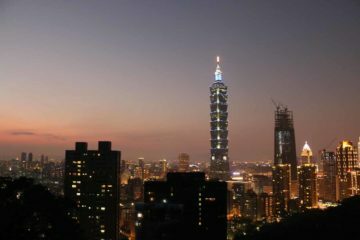 In fact, the trail to get to the view you see in the picture at the top of this page was actually closed to the public. And the only other way to get closer to the falls for a better look adn thus a more satisfactory experience required a somewhat dicey stream scramble. So as you can see from the photos on this page, we wound up not doing the stream scramble and had to be content with the subpar views. But it wasn’t for the lack of trying as we did try to explore all our options (as there were other trails in the area) before coming to this conclusion. Indeed, we had the sweat-drenched clothing triggering the memories to prove it, which I’m imparting on this web page. Our visit began from a pretty spacious car park (see directions below). From the far end of the car park, there was a wide path leading towards the falls though it couldn’t quite be seen yet. Almost immediately when the wide path began, there was an alternate path veering to the left that went up some wooden steps and followed along a wooden walkway going up even more steps to get higher above the ravine. 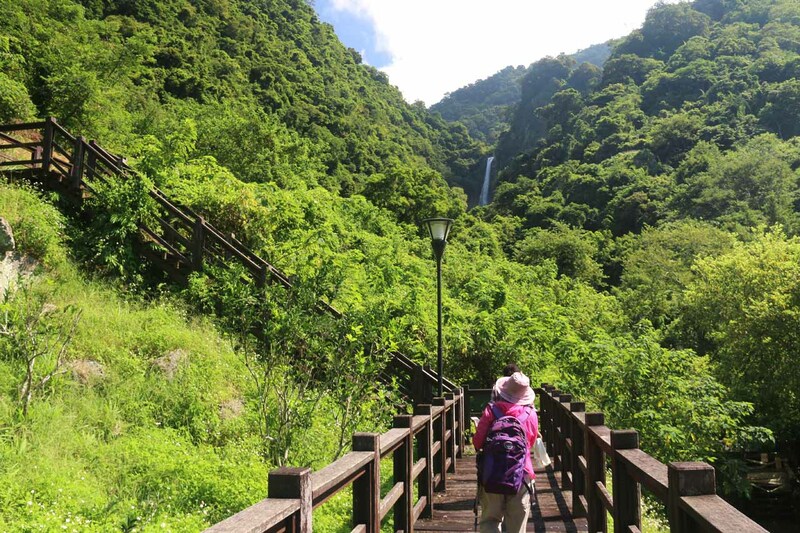 With quick elevation gain from this wooden path, it only took a few minutes to reach a corner where we got a pretty decent view of just the upper tier of the Luoshan Waterfall plunging off a cliff and definitely making us want more out of this experience. 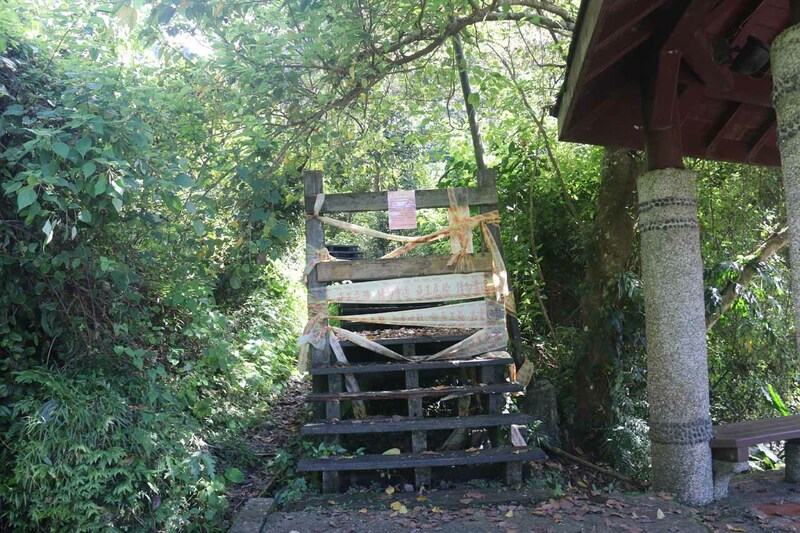 Well, it turned out that just to even get to this spot on the wooden path was supposed to be forbidden (as indicated by police tape discouraging usage from the bottom of the steps) because it seemed like the trail was suffering from rot. 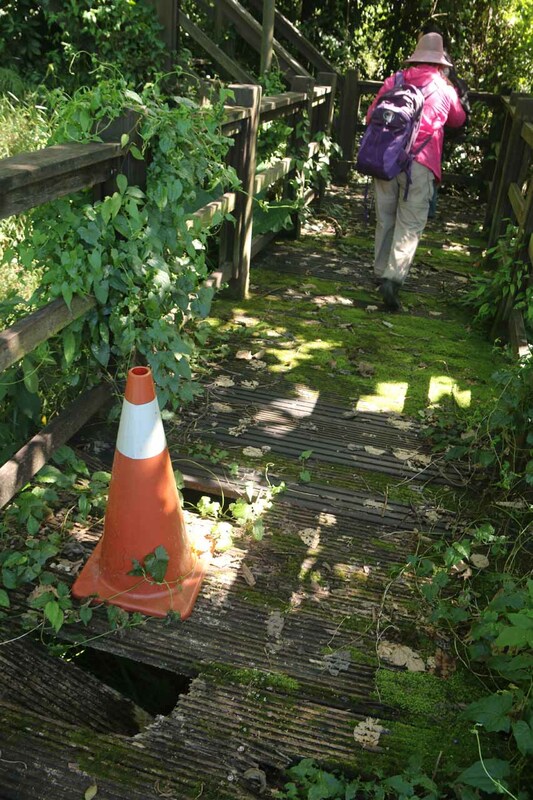 So it was quite dangerous to go on this path as any step away from the concrete supports below (we had to put weight whenever we saw nails in the wood) ran the risk of stepping through the rotted wood and fall into the crack where there could be a dropoff underneath. Anyways, it also turned out that the view we managed to get from this spot was the easiest and “safest” way to experience it (at least as far as our visit was concerned). 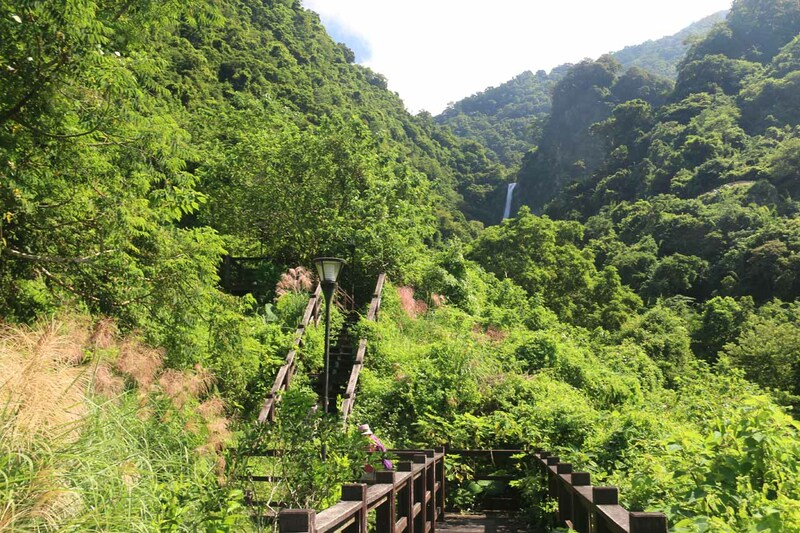 I actually explored further along this wooden path, which kept climbing up more steps (as well as more overgrowth), but it seemed like there was also more foliage blocking what would be even more commanding views of the Luoshan Waterfall. 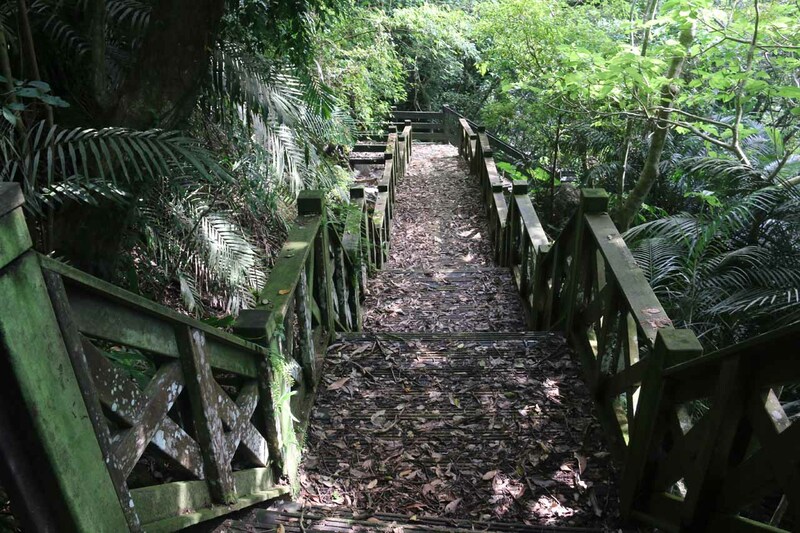 With fallen leaves also conspiring to obscure where I was supposed to put my weight on the rotting wooden planks, the path was definitely becoming more dangerous. 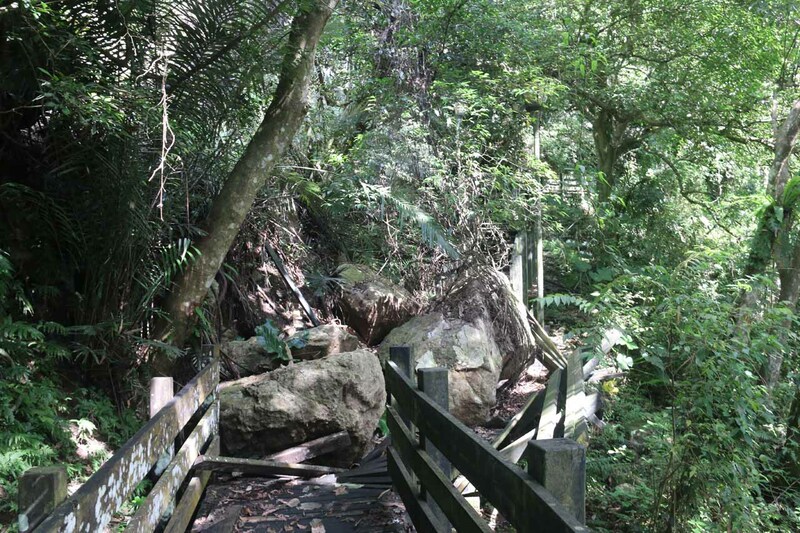 Eventually, the wooden path would loop back around past a section of the trail obliterated by a rock fall before descending to near a shelter slightly further up the wide paved trail near the car park. There was also police tape discouraging the use of this trail on this side of the looping trail as well. 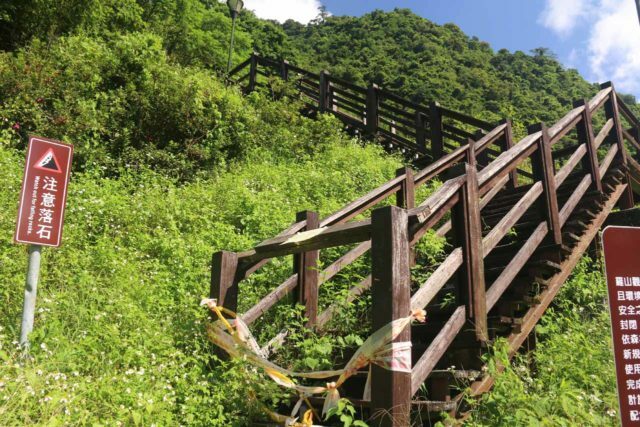 When Mom asked a local about the trail conditions, they said someone had an accident here a few years back and they decided it wasn’t worth the time and effort to upkeep that wooden trail. 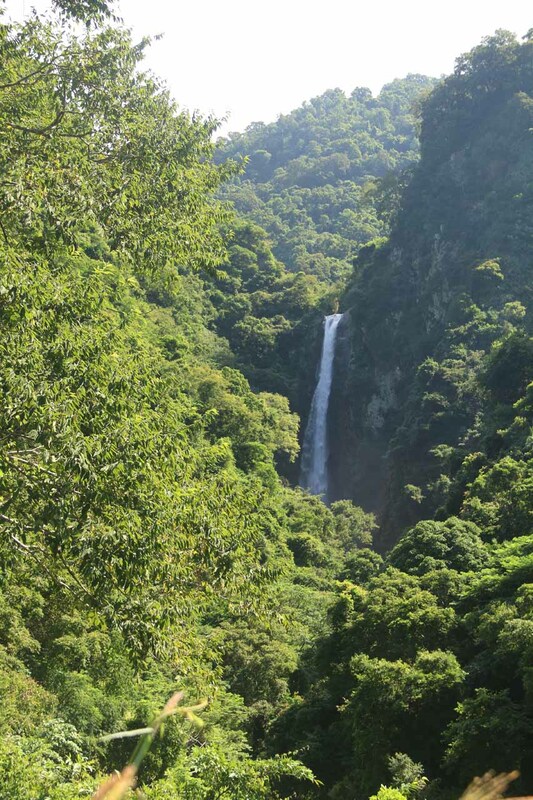 So naturally, I explored the other trails in the area to see if the view of the Luoshan Waterfall would improve. 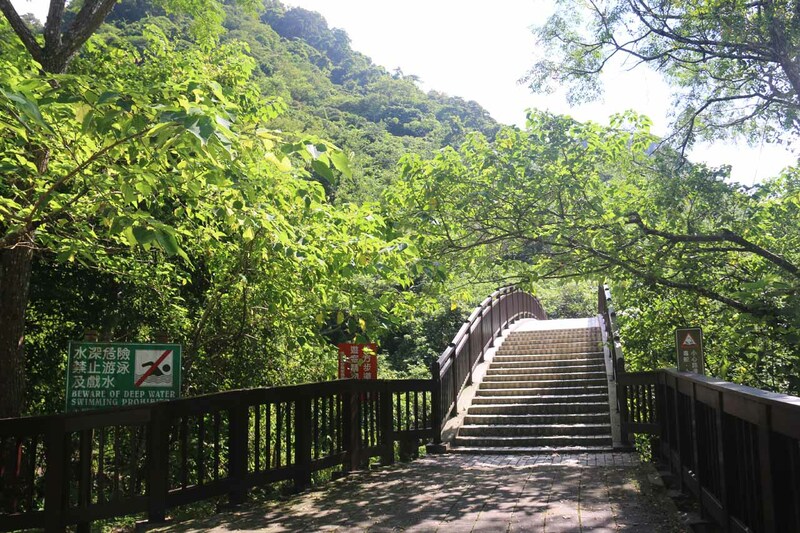 But to make a long story short, the main path would shortly turn towards a bridge over the waterfall’s stream then ascend up a somewhat overgrown path making a very steamy climb to an area that went away from the Luoshan Waterfall. 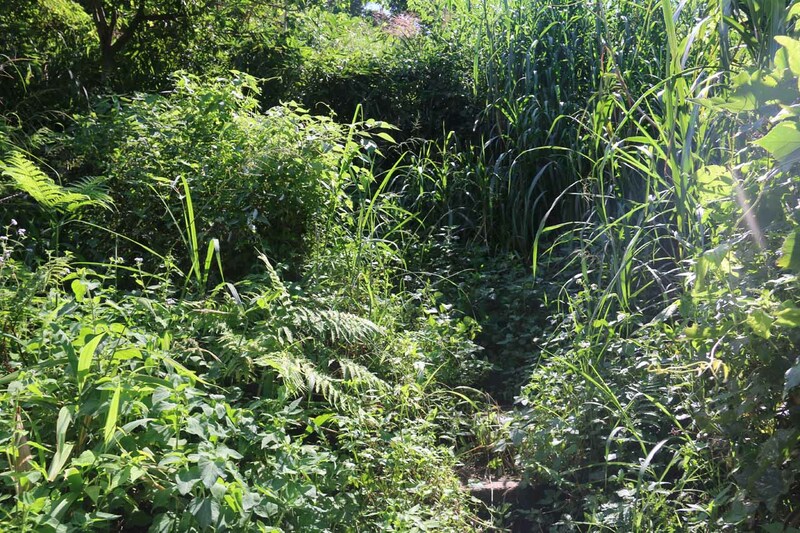 There was also a path leading to the bank of the stream descending from the near side of the bridge. The locals said that this was where the stream scramble to go further upstream to get closer to the lower drop of the Luoshan Waterfall was, but given the high flow conditions during our visit, I wasn’t keen to do this. 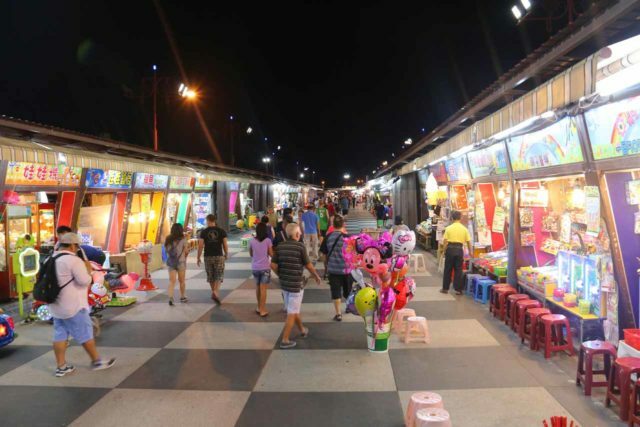 Thus, we were stuck with the unsanctioned view you see at the top of this page. 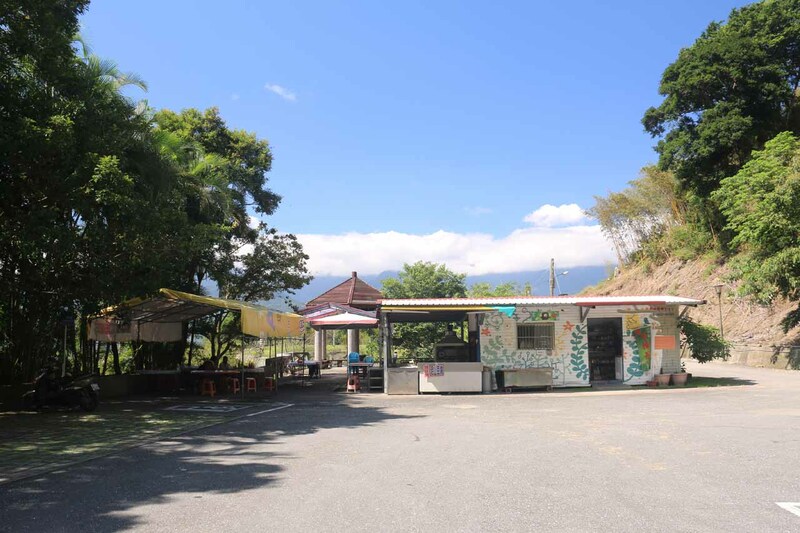 Now given the somewhat disappointing experience we had at this falls, we did have some opportunities to check out the views from behind the little food stand at the car park, where we gained panoramic views looking back towards the valley. Apparently, there was also a mud volcano down in the valley as well, but we didn’t visit it so we can’t say anything more about it. 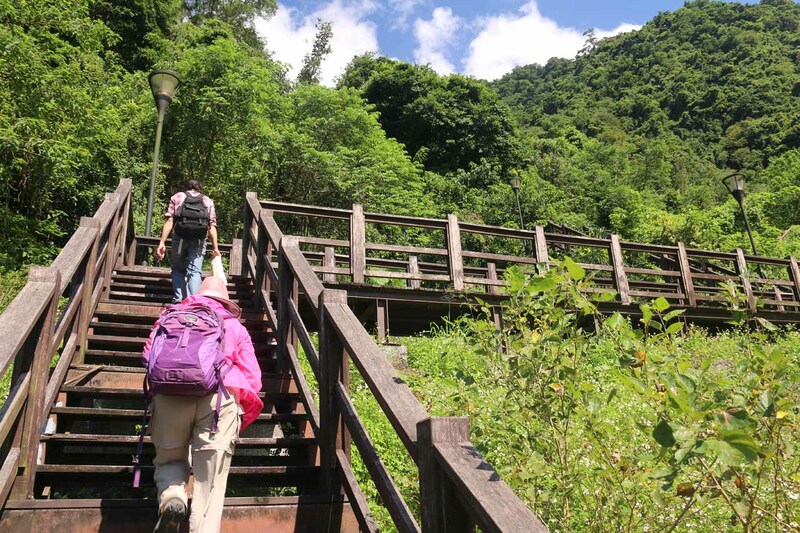 All told, the wooden path up to the somewhat OK view of just the upper drop of the Luoshan Waterfall would take roughly 300m round trip or less than 15 minutes total. We can’t say anything more about the stream scramble since we didn’t do it, but I’m keenly aware than stream scrambles would typically be more difficult to do due to the slippery wet boulders and the unpredictability of rock falls and flash floods so I’d imagine it would take much longer than the wooden path. 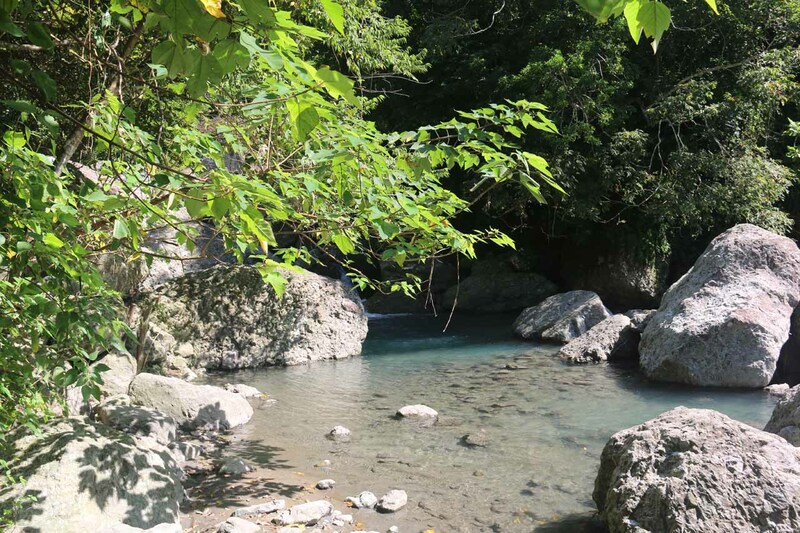 Even though they share Hualien County, the Luoshan Waterfall was actually further from the capital town of Hualien City (花蓮市 [Huālián Shì]) near the town of Fuli (富里 [Fùlǐ]) than it was from the city of Taitung (台東 [Táidōng]), which was in Taitung County. 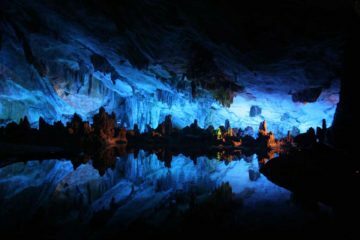 Since we drove down here from Hualien, we’ll describe that route first. 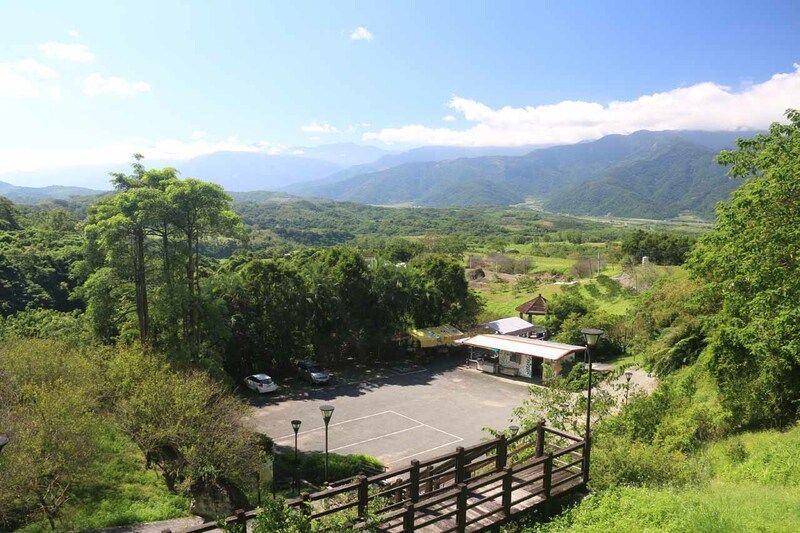 However, I’ll also describe the drive in the other direction from Taitung. So from Hualien, we pretty much headed south on the Tai-9 Highway (台力) for about 100km south to the Hua-79 (花79) road on our left. 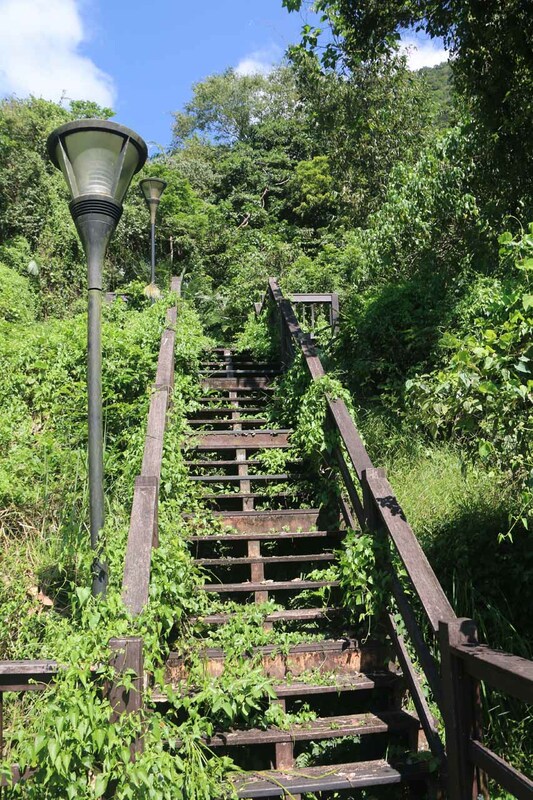 There was a signpost indicating that the Luoshan Recreation Area was in this direction. 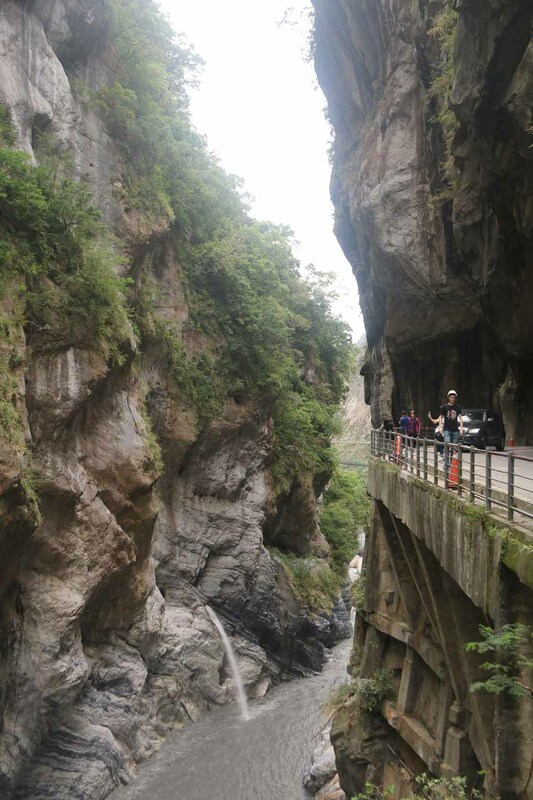 We then followed this local road (called the Jingping Industry Road) for the remaining 4.3km to its end at the spacious car park for the Luoshan Waterfall. Overall, this drive would take over 2 hours to go the 110km. 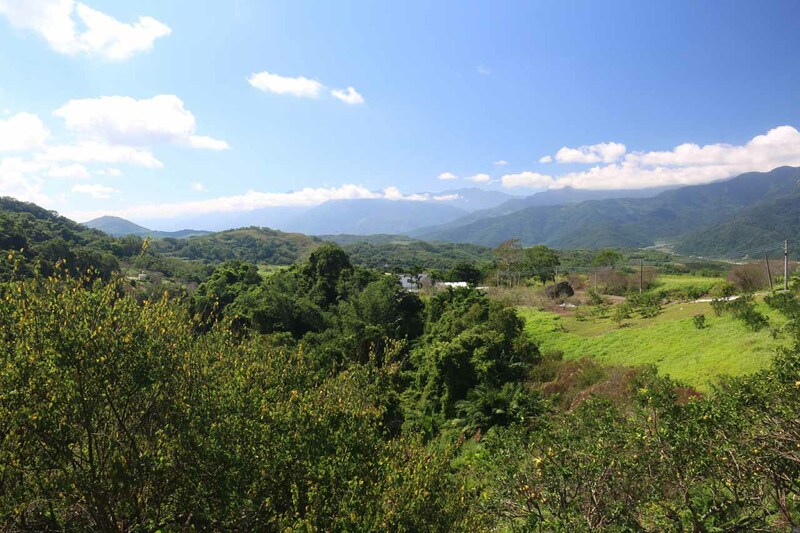 From Taitung, we would drive north on the Tai-9 Highway for about 62km to the signed turnoff for the Luoshan Recreation Area on our right. 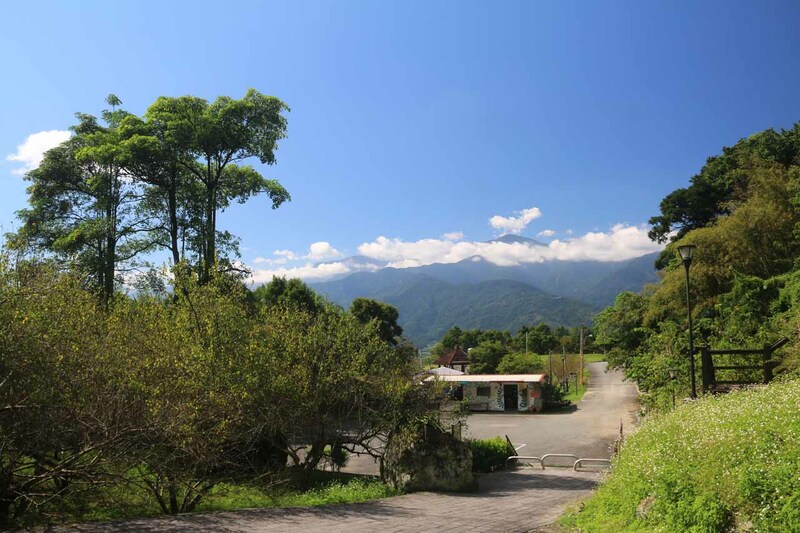 Then, we’d follow the local road for the final 4.3km to its end as in the directions above from Hualien. This 70km drive would take about 90 minutes. 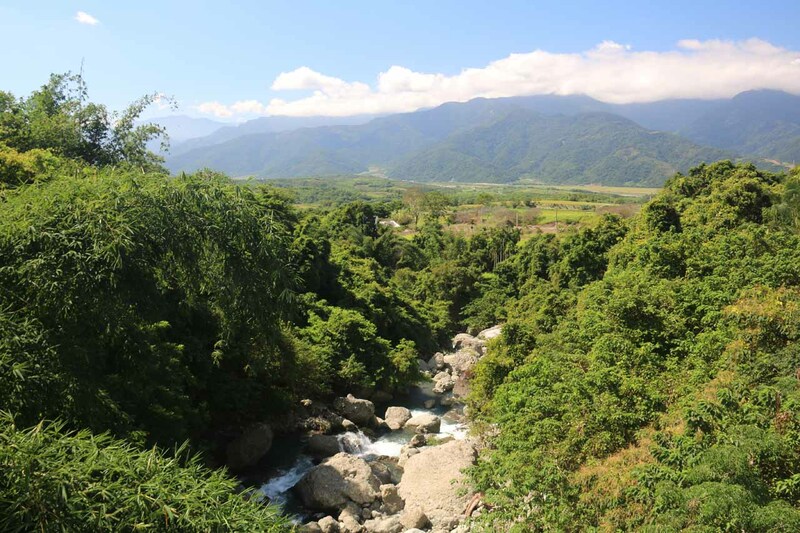 For geographical context, the Fuli was about 23km south of Yuli (玉里 [Yǜlǐ]; 30 minutes drive; nearby both Nanan Waterfall and Tiefen Waterfall), 59km north of Taitung (about 1.5 hours drive), 75km south of Fenglin (鳳林 [Fènglín]; under 90 minutes drive; nearby the Fenghuang Waterfall), and about 110km south of Hualien City (roughly 2 hours drive).